This is more of a continuation of my blog post on color temperature. Back when fluorescent light sources first came up, they changed the way humans thought about light and color rendering. A scientist named Arie Andries Kruithof performed some experiments on how the human eye relates the amount of light in a given time of day to the color temperature of the light source, and came up with a theory. As we move through the day, the amount of light we get keeps varying. Typically, human beings like higher color temperature light sources during the daytime hours, and lower color temperature sources once the sun goes down. People in warmer climates tend to favor cooler color temperature sources, and people in colder climates like warmer light. So what does this have to do with the Kruithof curve? Everyone is different and everyone perceives light in a different way. People living in different parts of the world have different preferences. But, in general, there is a correlation between the amount of light from a light source and the color temperature of the light source that seems to be fairly common among us all in most situations. 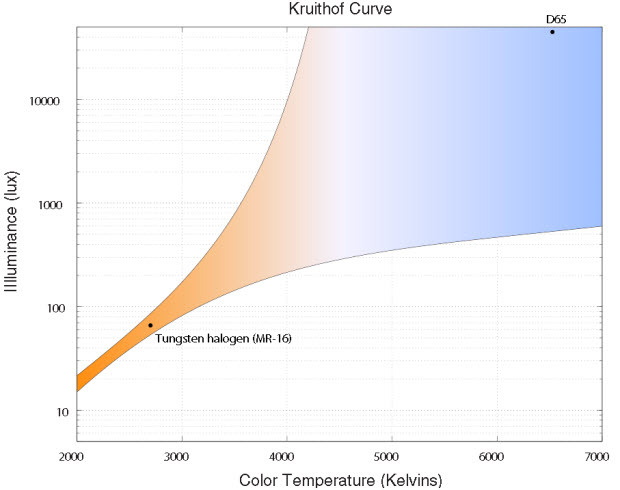 This is the study that lead Kruithof to come up with color temperature vs illuminance curve. Kruithof was working on visually pleasing light sources, and was interested in how adjusting the amount of light altered the amount of illumination needed to maintain a pleasing sense to the human eye. That graph that you see above shows us what combinations of color temperature and illumination are most pleasing to the human eye. What happens inside the human eye? As we all know, the human eye consists of rods and cones. The rods and cones work together, and once the amount of illumination reaches a certain low or high point, the rods (intensity sensors) lead the visual information to the brain. At night, when dusk conditions occur, you might notice that most of the colors in your view tend to be monochromatic, usually blue. This happens because of the the low level of illumination. This is where cones take over. We might have some almost built-in tendencies towards color temperature and light levels, perhaps somehow tied to the cycles of the sun. We might have a tendency to associate warm colors with fire light at night, and we might associate higher color temperatures with the mid-day illumination levels from the sun. This is not an exact science. Kruithof thought about it and this curve is what he came up with. Aesthetics is a subtle art and nobody really has the elixir to come up with something that works for everybody! This entry was posted in Camera, Image Processing and tagged Color, human eye, Images, Photography by Prateek Joshi. Bookmark the permalink.